The main change in 1977 was that the Cosworth DFX moved from being a curiosity in the back of a Parnelli to become the dominant engine. The catalyst was a new design from McLaren, the M24, based on their highly successful F1 M23 design. McLaren M24s were built for Johnny Rutherford (yet again; his fifth season at McLaren) and for Penske Racing for Tom Sneva (his third at Penske). Rutherford won four races to Sneva's two but the Penske driver scored where it mattered, a win at Pocono and second at Indy, and won the title comfortably. 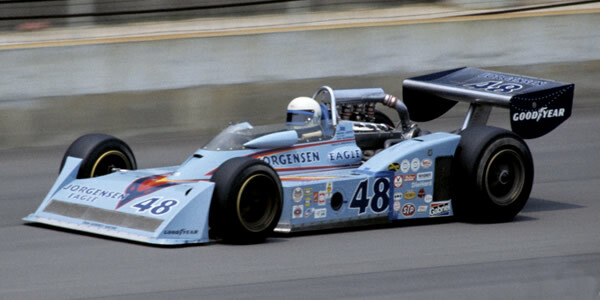 The Penske team also entered a second McLaren M24 at some races for Lotus F1 driver Mario Andretti and also introduced their own interpretation of the McLaren, the Penske PC5, later in the season. Al Unser in the well-sorted 1975 Parnelli won at Ontario and took second in the title race while Foyt won Indy in his Coyote-Foyt to tie with Rutherford for third. The second Parnelli was handed to Formula 5000 graduate Danny Ongais in 1975 who brought Interscope backing. He got quicker as the season progressed and won at Michigan before taking pole position in three of the next four races. Patrick Racing were sidetracked by the new Drake V8 engine, a flop, and also had the misfortune of wrecking their latest Wildcat on its first outing. Johncock and Dallenbach were fifth and sixth in the title using Mk 2 Wildcats with DGS power. Eagle tried a comeback in 1977 with a new offset Offy-powered design for Pancho Carter but the car was not a great success. The other "last hope" for the Offy powerplant, the Lighting "laydown" only appeared once at the end of the season. Lindsey Hopkins had commissioned a set of production Lightnings for 1977 and these were enthusiastically adopted by regular teams Fletcher Racing and Jerry O'Connell to replace their old Eagle stock but also by Alex Morales' new team which ran a pair for Bobby Olivero and Vern Schuppan.